Bad Penny: Wigilia! Has nothing to do with the Wiggles. She'll come back, as soon as she's ready. Wigilia! Has nothing to do with the Wiggles. Settling into work and study again after a whirlwind, but somehow slow, trip to poor, dusty, torn-up and glittering countries is not easy. Watching one of your best friends on this side of the world divest himself from a radio show, and agreeing to take on half his position, is time-consuming. The wireless broadband we were ... ahem ... piggy-backing on suddenly acquired a password, metaphorically changing the locks and kicking us out of the internet. We came home to find all our metaphorical clothes out on the landing. The tennis is on. Since last year's Australian Open, I have become a die-hard Grand Slam fan. It's two weeks of non-stop. I can't take my attention off it. And then with flicker and a sigh, my dear iBook's lights went out. I feared the worst-- why did I never buy that external hard drive? ?--but was spared this time. Only the screen was broken, in fact, only the tiny wire that speaks to the screen was broken, and for the low low price of $125, my 5-year-old computer is alive again. And so I can tell you about Bangkok. But first, I should tell you about Wigilia. Monika is Australian, but her family is Polish, and being such, I'm certain they do many Polish things. But there's only one I can tell you about: Wigilia. Pronounced veeGEElia, the "g" like that in "girl," and rooted in the same words that eventually grew into words like "vigil," Wigilia is the Polish celebration of Christmas Eve. It's a big European thing to have the whole family celebration and presents and all on the Eve rather than the Day, almost as big as Eurovision, but without all the spandex and fake blood. I digress. 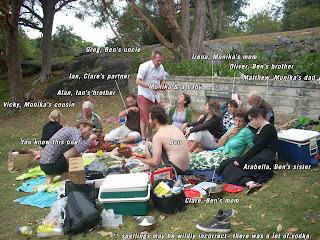 Benedict and Monika invited us to Wigilia this year, likely out of sympathy for our lack-of-family holiday behaviour. Twice in two years, we have booked flights on Christmas Day; yes, we have elected, under no kind of duress, to deal with airports on Christmas Day. Whatever their reasons, we could not have been more honoured. 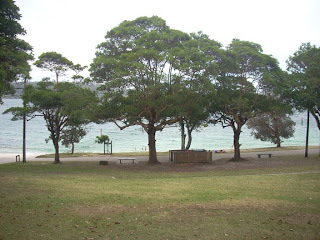 Nielson Park is on Sydney's south shore, a tip of one of the city's many outstretched fingers of land, inaccessible and rich and beautiful. This Wigilia ended up sort of Australian and sort of Polish, meaning we drank vodka at the beach, and we ate borzka (beetroot soup, but the spelling is probably wrong) at a picnic. 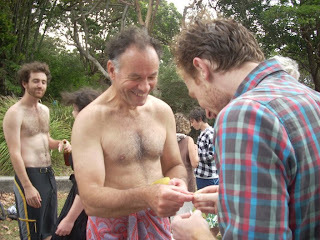 It wasn't a sunny day, but people still jumped in to have a dip. But Arabella, Ben's sister, and I preferred watching the others brave the slaty water, the slaty sky, and the windy space between. The first Polish tradition we followed involved lots of wafer-breaking. Monika had a big wafer, which she broke into pieces, one bit of wafer for each guest. And then we went and individually wished everybody else a happy christmas, and traded bits of wafer. 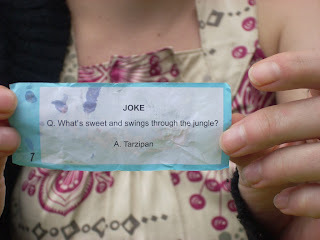 It was an awkward, giggly, humbling, and opening experience, wandering around a picnic site, kissing, embracing, and sharing tiny scraps of dry flavourless wafer with someone you hardly know, only to move on to the next person. Oliver, Ben's brother, is a silent sort of teenager, so the wafer-wishes were the most I heard from him all day. Here, you can see Ben happily drinks beer in the background, while Craig and Ian (Ben's mom's partner) happily trade best wishes for the new year. We also ate delicious mustardy potatoes, and there were mushroom dumplings for the soup. Matthew brews the borzka for three days or something outrageous, creating a beetroot soup even I enjoyed. Another Polish tradition: one of the dumplings has an almond in it, and whoever gets the almond is king for the day, or I suppose, queen. It reminded us of the New Orleans King cake tradition. Ian found the almond, and Clare called "HRH" for the rest of the day, short for "His Royal Highness," which I thought was an appropriately Australian snipping of a Polish-made poppy. 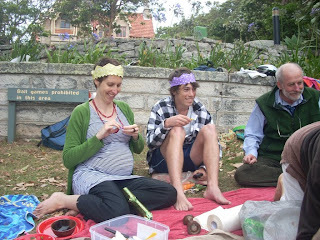 Once we broke the Christmas crackers, though, everyone had a crown! holiday, because I never like to be unprepared-- as you know. I had heard about a tradition called "The Uninvited Guest," wherein an extra place is always set, just in case someone unexpected shows up. Everyone should feel welcome at Christmas dinner. But I also heard that if no one did show up, the Uninvited Guest is insulted, spat upon, starved and generally abused all night. This idea felt so compelling to me-- it felt so right. This is what Western holiday traditions lack; this is why we get so sick of the Christmas season, being nice nice nice to everyone for weeks. And there's a darkness to it, too; a darkness that's missing from so much of Western spirituality, anger mingled with joy. This idea felt right. I asked Monika's mother about it, and she didn't think it was true. She said it was possible they do this in another region, but it seems too much against the Christmas spirit. Looks like I'll need another theory. 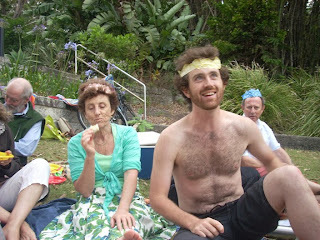 Since this Wigilia was a picnic with no place settings anyway, we didn't quite observe this tradition. But because so many other picnickers were also at the park, you could say there were many, many uninvited, but welcomed, guests. Alan, Ian's brother, managed to strike up conversations with almost all of them. Matthew, Monika's father, gave a lovely and very dad-like toast. "I think that all of us should meet again on the odd days of the week, and also on the even days of the week." Then there was a story about three princes who competed for ascension to the throne, but I didn't understand the punchline. And as the day grew dark, the party moved to Clare's home, where there was more vodka, and Oliver practiced on the piano, until everyone gathered around and started singing Christmas carols. In Poland, you have to sing carols, to let Father Christmas know where you are; only then will he leave presents. Vicky, Monika's cousin, and Irena even sang some Polish ones. For the first time in my brown life, I stood around a piano on Christmas Eve, and listened to people sing carols. I didn't know the words. and it turns out, barring Jimmy Stewart movies, most people don't know the words to Christmas carols. It's been seven years with this boy, and seven years of ignorance at that. Craig sings Christmas carols. With all his heart. He pantomimes them. He leads them. I slowly backed away in shock; I almost knocked Ben over with my slow backing away. Ben said it was the first time his family had ever done that; he was a little in shock as well. And Father Christmas had indeed made his delivery, so we sat down to a White Elephant exchange. Benedict got an awesome bocce ball set (jealous! 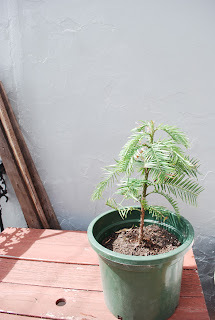 ), but in the end, Craig and I came out the proud owners of a young Wollemi pine! Isn't he cute? It's not the first time we were away from home for the holidays, and it's not even the first time we've spent holidays with other people's families. But this time was different; this time, we felt truly included, fully welcomed. Exhausted, happy and thankful for being invited to celebrate with this group of wonderful people, Craig and I went to spend our last night at home... for a few weeks anyway. Thank you, Ben and Mon, for inviting us to this. We'll never forget it. This work by Nija Dalal is licensed under a Creative Commons Attribution-Non-Commercial-No Derivative Works 3.0 Unported License. The Year of the Elephant!